The question is; Is milk really a good food for the human body, or are its health effects detrimental? The Department of Health currently recommends consuming 3 serves of dairy a day, this equates to 1 glass of milk, 1 tub of yoghurt and 2 slices of cheese. The questions we all should be asking is milk really a health food? Should we be eating dairy at all? What is the science behind these recommendations? The truth is there is in fact no biological requirement for the human consumption of cow’s milk. Cow’s milk is the perfect nature food, but only if you’re a calf! For the most part, evidence of milk’s benefits is grossly overstated, whilst the evidence for its detriments on human health continues to grow. In fact, if a study is funded by the dairy industry it’s 8 times more likely to show benefits than independently funded studies (1). A research article published in the Journal of the American Medical Association by Dr David Ludwig and Dr Walter Willet, leading nutrition researchers at Harvard University, showed a lack of evidence for the current government recommendations (3). The study found there was absolutely no data to support the claim that getting your 3 servings of dairy led to stronger bones, weight loss and overall better health. In fact, the scientists discovered something troubling, serious side effects linked to dairy consumption. This included increased fracture and cancer risk, weight gain and less serious problems such as constipation, irritable bowel syndrome, flatulence, eczema, acne, bloating and diarrhoea (3). Did you know that eating dairy products has NEVER been shown to reduce fracture risk? (5), in fact in stark contrast the Nurse’s Health Study found dairy to increase the risk of fractures by 50% (4). Countries that consume the least amount of dairy and calcium such as Africa and Asia have the lowest rates of osteoporosis. Studies have shown that increased intakes of calcium and dairy can increase the risk of prostate cancer by a staggering 30-50% (6). Dairy contains IGF-1 (insulin-like growth factor) known to promote the growth of cancer. Dairy increases the risk of type 1 diabetes (7). 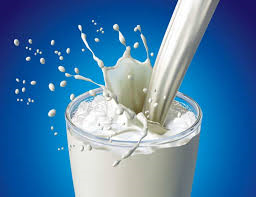 Dairy is a well known cause of acne, sinus infections and allergies (8). Another troubling fact about dairy is it’s composed of a very large and allergenic protein called casein, which can be very hard to digest for most humans. When the body is unable to digest this large protein it may sit in the gut and begin to ferment causing tummy troubles such as flatulence and bloating. Casein also promotes inflammation and mucus production by releasing histamines and a potent neuropeptide called casomorphin. Histamine causes digestive cramps, migraines and other painful symptoms. Casomorphin has a negative impact on the brain and nervous system. It causes fatigue, depression and food bingeing. Furthermore, did you know that the human body’s ability to produce the enzyme lactase, required to break down lactose (the sugar in milk) significantly diminishes between the ages of 2 and 5. The human body just isn’t designed to drink milk after breastfeeding, in fact no animal in nature drinks milk post weaning. You’re much better off getting your calcium from fruits, vegetables, nuts and seeds such as white beans, salmon, sardines, almonds, bok choy, kale, oranges, turnip greens, brazil nuts and sesame seeds. So what about organic milk? Although organic cows are free from antibiotics and pesticides, the cows are milked when they’re pregnant, producing milk that is full of anabolic hormones meaning they help to promote growth. Approximately 60 different types of anabolic hormones such testosterone, insulin like growth factors 1 & 2, androstenedione, progesterone are in your glass of milk, all with the potential to be cancer promoters. If you’re worried about the milk in infant formula remember it is broken down making it much easier for your little one to digest. Once your child hits 1, switch them over to real foods and unsweetened almond or rice milk. If you’re finding it hard to get by without dairy then try switching to coconut yoghurt as a healthy alternative to cow’s yoghurt. A final word the now famous Nurse’s Health Study examined health habits of 47,000 nurses and found that those who drank more milk as teenagers had much higher rates of severe acne than those who had little or no milk as teenagers. If you think it is the fat in milk, think again. It was actually the skim milk that had the strongest risk for acne. In other studies of over 10,000 boys and girls from 9 to 15 years old, there was a direct link between the amount of milk consumed and the severity of acne. Disclaimer: This article is not intended to provide medical advice, diagnosis or treatment.